Housecleaning is an unavoidable part of life, but it doesn’t have to be toxic. 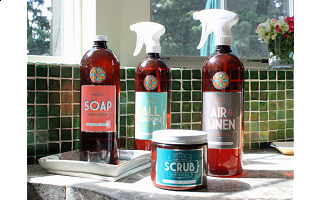 After finding unpronounceable synthetic ingredients in her favorite green cleaners, Kayce Thompson-Russ started crafting her own household cleaning products. She took inspiration from her farming family, and in particular, her great-grandparents, who had a knack for finding natural home remedies for everyday ailments. Working out of her loft in Brooklyn, N.Y., Kayce refined her recipes for botanical multi-purpose cleaners and launched HAVEN. HAVEN’s all-natural cleaners get the job done as well as conventional alternatives, but without synthetic ingredients or noxious aromas. Kayce’s formulas are biodegradable and free of parabens, phthalates, dyes, and phosphates. You won’t find any petroleum-based, animal-derived or caustic ingredients, either. Most of the product bottles (which are 100% post-consumer recycled plastic) are designed to be refilled. Multipurpose is a key part of Kayce’s mission. 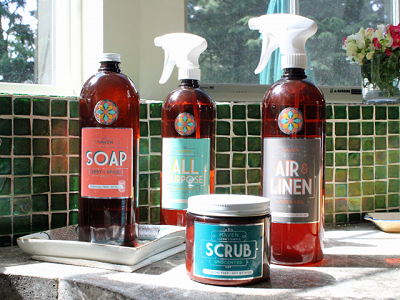 You can tackle more chores with fewer products, which translates into less plastic waste. And once you get a whiff of the incredibly fresh, botanical scents, you’ll be inspired to find even more creative uses for HAVEN’s hardworking products. Happy Summer everyone! I can't tell you how excited I am to be a part of the Daily Grommet team and how thrilling it is to share HAVEN with such excellent, eco-conscious consumers. Every bottle of HAVEN product is lovingly crafted, bottled and labeled by hand in Brooklyn and packed with only the best natural ingredients. I'm passionate about sustainability and want you to know that every dollar spent with HAVEN is a dollar that goes toward protecting the best interests of our beautiful planet. With our intelligent refill model, you'll not only be able to drastically reduce plastic consumption and waste but save money while you're doing it. Plus, every HAVEN product is multipurpose, so you can clean much more with less product. I love chatting about all the creative ways you can use HAVEN in your home, so ask me anything! Thanks so much for your support! Hi Kayce, could you give us some more information about how to use the various products in multiple ways? Or does the information about which conventional household products each one is designed to replace some with the Haven line? All Purpose will replace traditional cleaners for countertops, glass, tub and tile, stainless steel, butcher block, sealed marble and granite and will even work as a laundry stain pre-treater and carpet cleaner. Air & Linen is like Febreze or Lysol but without all the chemicals. It's formulated with botanical ingredients that help kill germs on fabrics, hard surfaces and in the air. I keep a bottle by the bed for linens but it's still tough enough to use on smelly surfaces anywhere around the home. It's also a great wrinkle releaser - hang stale clothing and dampen with Air & Linen and watch things smooth right out! Scrub in an unscented powder that's like Bon Ami but uses natural fruit acids to scour pots and pans, clean tub and tile, polish metals (it's great on tarnish!) and it melts away soap scum. For extra tough jobs, I love making a soft scrub by blending Scrub with All Purpose or our castile Soap. I clean my shower with this mixture and don't even need gloves to get things sparkling. Love that. Soap is a castile, do-everything formulation. It smells heavenly and is packed with emollients that make it way less harsh on skin than traditional castile soaps. It's still extra-tough on greasy dishes but gentle enough for use as hand soap. I use it to mop, for laundry, to clean my jewelry and anywhere else soap is needed. Finally, Polish is a traditional raw beeswax furniture polish with loads of uses. It conditions with organic, cold-pressed natural oils. I use in on both finished and unfinished wood, to condition leather boots and bags and even to polish my stainless steel appliances. Just dip in clean rag in the tin, apply to surface and buff to a shine. The added bonus is that after I'm done, I love using the excess on my hands and cuticles because it smells so yummy! I hope this is helpful! Thanks for visiting, Wendy. I received two of these products from Blissmore. The Sprayers don't work and emails to them were unanswered. Beware! Also, some customers didn't realize that the product comes in a concentrated form and needs added water. The just-add-water sample sizing was a special thing we did with Blissmo to help acquaint people with the concentrated refill model but samples ordered anywhere online will come pre-filled with water and ready for duty! Thanks so much! Kayce will be able to stop back in the morning to answer your questions. Thanks for posting! Housecleaning is an unavoidable part of life, but it doesn’t have to be toxic. After finding unpronounceable synthetic ingredients in her favorite green cleaners, Kayce Thompson-Russ started crafting her own household cleaning products. She took inspiration from her farming family, and in particular, her great-grandparents, who had a knack for finding natural home remedies for everyday ailments. Working out of her loft in Brooklyn, N.Y., Kayce refined her recipes for botanical multi-purpose cleaners and launched HAVEN. HAVEN’s all-natural cleaners get the job done as well as conventional alternatives, but without synthetic ingredients or noxious aromas. Kayce’s formulas are biodegradable and free of parabens, phthalates, dyes, and phosphates. You won’t find any petroleum-based, animal-derived or caustic ingredients, either. Most of the product bottles (which are 100% post-consumer recycled plastic) are designed to be refilled.